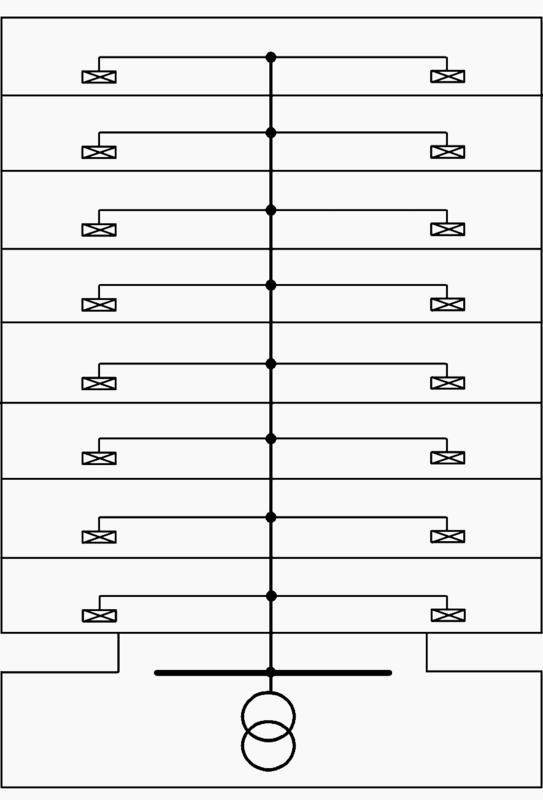 In large buildings the type of distribution depends on the building type, dimension, the length of supply cables, and the loads. In most cases a high voltage supply and transformer substation is required. 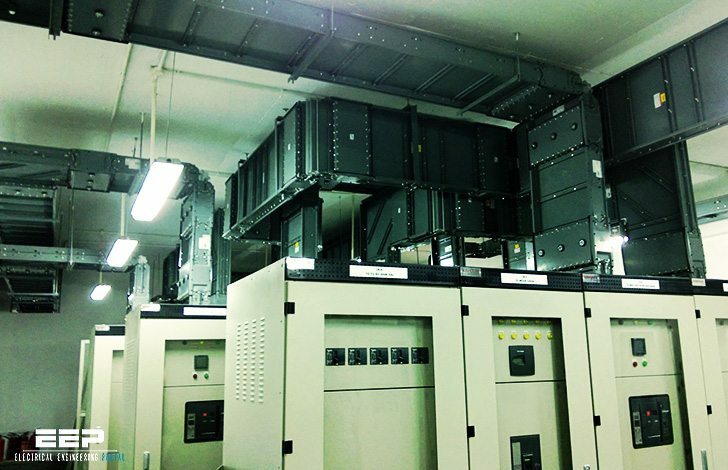 Normally HV switchgear and substation transformers are installed at ground floor (or basement ). However, often there are appliances with large power demand installed on the top floors (converters and motors for lifts, air-conditioning equipment and electric kitchens). As it is desirable to bringing the high voltage supply as close as possible to the load centers, transformers are installed at the top floor, or if required, additional ones are installed on one of the intermediate floors. 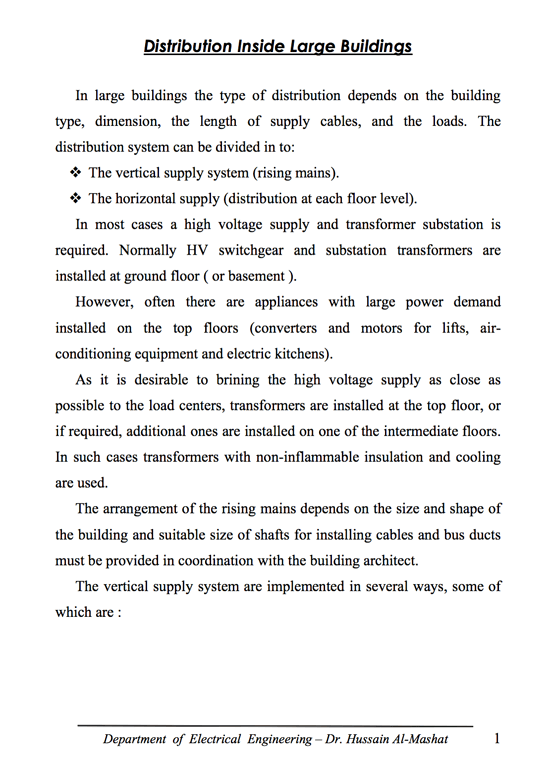 In such cases transformers with non-inflammable insulation and cooling are used. The arrangement of the rising mains depends on the size and shape of the building and suitable size of shafts for installing cables and bus ducts must be provided in coordination with the building architect. The vertical supply system are implemented in several ways, some of which are: single rising main, grouped supply, individual floor supply, ring main supply, double feed supply and others. Applications: Where high supply security is not important. Disadvantages: Low supply security (a fault in the rising mains effect all floors). there are various opinions between silicone rubber manufacturers about the suitable formulation and composition of contents and their percentage by weight in a compound for high voltage outdoor composite insulators and clients as well,they ask for different amount of silicone and silicone oil in their insulator compound, but none of the compound manufacturers accept to change their own formulation, would you please let us know the opinion of your experts in this regard and a right formulation for that. Your kind attention and prompt reply will be appreciated.